This is the first game in the Tekken series. For other games in the series see the Tekken category. 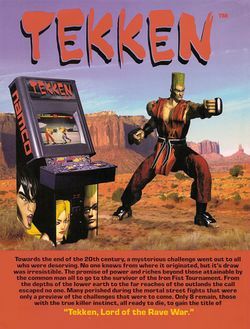 Tekken is a one-on-one fighting arcade game that was released by Namco on December 9, 1994; it was the first game that ran on the company's then-new System 11 hardware (a PSX CPU running at 16.9344 MHz, with a C352 custom sound chip running at 16.384 MHz). Both of the players must use an eight-directional joystick for taking control of two of eight fighters (Kazuya, Paul, King, Nina, Jack, Law, Michelle, and Yoshimitsu), with four buttons (two for left and right punches, and two for left and right kicks) - and once all seven of the other fighters have been defeated for the single-player mode, your fighter must face off against his (or her, in the case of Nina and Michelle) own unique mini-boss before a final battle with the host of the "Iron Fist Tournament" ("Tekken" is Japanese for "Iron Fist"), Heihachi Mishima. The game was later converted to the Sony PlayStation system in Japan in March 1995 (later released in both the United States and European Union in November of that same year). If the arcade operator has set the "NUMBER OF VS MODE WINS SHOWN BY" setting in the game's options menu to "FRUIT", several bonus items from Namco's earlier Pac-Man and Dig Dug series will appear in the bottom-left (or bottom-right, in the case of 2P) corner of the screen (along with Blinky, a Rally-X Special Flag, a Scared Ghost, and Pac-Man himself) when the players win battles in the two-player mode; these symbols are also displayed on the "Ranking 2P Game Wins" table, shown during the game's attract sequence. Paul, Heihachi Mishima and Kuma (Paul's unique mini-boss) also went on to appear in less serious-looking forms as the Namco All-Stars' short-stop, second-baseman, and third-baseman, as did Nina and Anna (Nina's sister and her unique mini-boss in the game) as two of the Nikotama Gals' pitchers, in Super World Stadium '99 with several other older Namco characters. This page was last edited on 26 August 2016, at 16:00.